ANEF charts are contour maps that show a forecast of aircraft noise levels that are expected to exist in the future. ANEFs are primarily used by state, territory and local government planning agencies for land use zoning purposes. They are prepared for all of the major and regional airports, and most of the minor aerodromes that have a large number of annual movements. Section 5 of the Commonwealth Airports Act 1996 defines an ANEF for an airport to mean an ‘ANEF endorsed in the manner approved by the Minister’. Section 71(2)(d) of the Act outlines the contents of airport Master Plans and stipulates that an ANEF forms part of these contents. The Master Plan and ANEF cycle is currently 5 years for Sydney (Kingsford-Smith) Airport, Melbourne (Tullamarine) Airport, Brisbane Airport and Perth Airport. Any other federally leased airport will be required to compile a Master Plan and ANEF every 8 years. Other non-federally leased airports are also able to develop Master Plans and ANEFs. However, they do not have time restrictions placed upon them. As per Appendix B1 of Australian Standard 2021:2015 – Acoustics – Aircraft noise intrusion – Building siting and construction, these non-federally leased aerodromes can still use an ANEF to assist in identifying areas where noise sensitive development should be controlled, and to help to ensure the long term development and sustainability of airport operations. 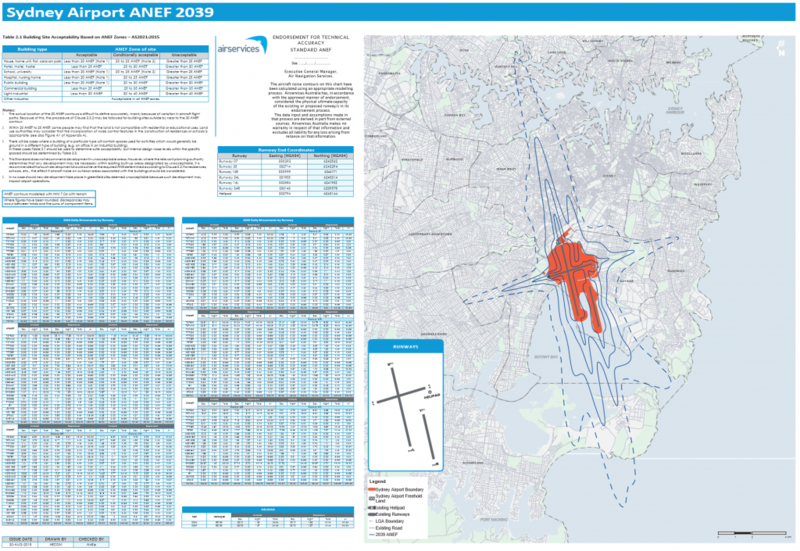 The figure below shows the recently endorsed ANEF for Sydney Airport for 2039. ANEI charts are contour maps that show actual, historical aircraft noise levels over a given period of time, where the specific numbers and types of aircraft that operated at the aerodrome are known. An ANEI shows the average daily aircraft noise exposure index around the aerodrome for that year (AS2021:2015, Appendix A3). Airservices has historically completed the quarterly and annual ANEI charts and associated reports for Sydney Airport, which are available on the Australian Noise Exposure Index Reports page. Consistent with part (x) of Ministerial Direction M37/99, Airservices is responsible for endorsing the technical accuracy of ANEFs and ANEIs for all Australian airports. Airservices Airport and Environmental Assurance (AEA) Team considers a number of assumptions and inputs when conducting technical endorsements of ANEFs. These assumptions and inputs can be found in the updated ‘manner of endorsement’ document approved by the former Minister Infrastructure and Transport in April 2017.
any other matter the endorser considers relevant in deciding whether to endorse the ANEF. In order to begin the ANEF preparation process, airports and their consultants usually request recent sets of aircraft movement data for their airport from Airservices Noise and Flight Path Monitoring System (NFPMS). In order to request this data, please complete and submit a tailored data order form via the Airservices website. Please note that sufficient time should be allowed for the data request process (eg. 4-6 weeks), prior to commencing preparation of an ANEF. This is to ensure that a standard Airservices data licence (legal agreement) is completed between Airservices and the airport. The data requested will then be compiled by Airservices AEA Team and sent by email to the airport (or their consultant). Airservices strongly recommends that airports/consultants notify Airservices AEA Team via email NoiseEnviroTeam@AirservicesAustralia.com, 1-2 months prior to submitting an ANEF information package for endorsement, to identify any issues early on and ensure that proposed timelines can be agreed and met. An ANEF technical report and appendices. All ANEF technical endorsement submissions and queries should be sent to NoiseEnviroTeam@AirservicesAustralia.com. Email attachment size restriction is 20MB, please compress larger files or send files in multiple emails with the same subject line. Allow 10-12 weeks for the ANEF technical endorsement process. This time frame starts only when the full ANEF information package is submitted by an airport (or their consultant) for technical endorsement. If Airservices finds any issue with the ANEF information package that needs further clarification, this time frame will be paused until that information is received by Airservices. In order to complete the ANEF chart endorsement process, Airservices AEA team will provide airports (or their consultants) with electronic copies of the relevant Airservices signature block for inclusion on the electronic version of the chart. The airport/consultant will then be responsible for printing out three physical copies of the chart (usually as A1 size), and delivering them to the appropriate Airservices location for physical signature by the relevant Airservices manager. The AEA Team can advise the airport/consultant who the relevant manager is, on an airport by airport basis. Ensure you leave 1-2 days for this process at the end of your ANEF preparation schedule. Airservices is proposing a 12 month transition period from using the US Federal Aviation Administration’s (US FAA’s) Integrated Noise Model (INM) to the Aviation Environmental Design Tool (AEDT), from 1 January 2019 to 31 December 2019. During this period, airports and their consultants will be able to submit their ANEFs and ANEIs for technical endorsement by Airservices, using either INM or AEDT (one model only). After 31 December 2019, Airservices will only accept ANEFs for technical endorsement that have been produced using AEDT. Visit the US Federal Aviation Administration website for more information on AEDT. More information on this transition period will be provided on this website and directly to key stakeholders shortly.